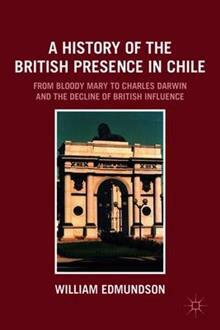 This book sets out to narrate the contributions to and influence on the history of Chile that British visitors and immigrants have had, not as bystanders but as key players, starting in 1554 with the English Queen 'Bloody Mary' becoming Queen of Chile, and ending with the decline... read full description below. Chileans are often called the 'English of South America'. This book narrates the tremendous influence that British visitors and immigrants have had on the history of Chile, starting in 1554 with 'Bloody Mary' becoming Queen of Chile. This is an informed, comprehensive, and balanced account that includes original research, and will appeal to students of Latin American history, the general reader, and travelers to Chile. Edmundson tells several stories, including Charles Darwin's seventeen months in Chile, the British stamp on the history of Patagonia, the story of the 'Nitrate King', and British participation in the War of Independence. William (Eddie) Edmundson works as a consultant and writer in Recife, Brazil, following a career in teacher training and management with the British Council that has taken him to Colombia, Mexico, Brazil, Chile, and his most recent appointment as Director Cuba. Fluent in Spanish (and Portuguese), he started research into the history of the British presence in Chile while Director of the Chilean-British Institute in Concepcion, in 1984-1990. His most recent book also has a strong focus on Chile - The Nitrate King: A biography of John Thomas North, published April 2011. William Edmundson has also published widely on English language teaching, and on the survival of steam locomotives in Latin America.